Scott Eisen/Getty ImagesWaves crash over a house in Scituate, Massachusetts, on Friday. 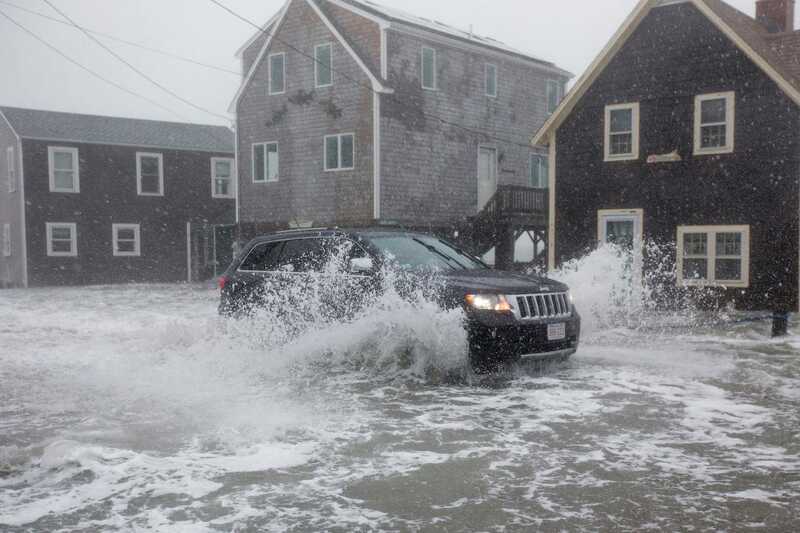 Winter Storm Riley is rip-roaring its way along the East Coast, slamming homes in Massachusetts with a wall of water. 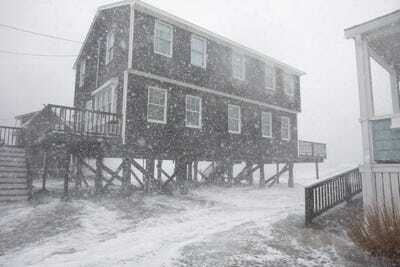 The nor’easter– also known as a bomb cyclone – is bringing devastating winds to areas along the eastern seaboard. It’s too windy to operate at airports in New York, while people flying into Washington, DC, are apparently getting jostled so much they’re vomiting during the flight. Meanwhile, Boston is getting hit with a wall of water and rain. 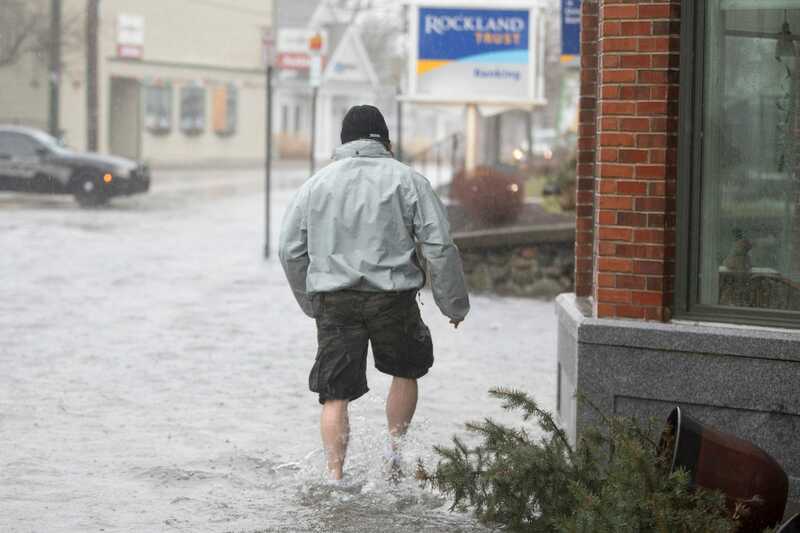 It’s the second time this year that Bostonians have had to dig, paddle, and sandbag their way through a severe storm. Take a look at how bad things are getting. In Boston, some luxury condos were already flooded on Friday morning, before the worst of the nor’easter got underway. 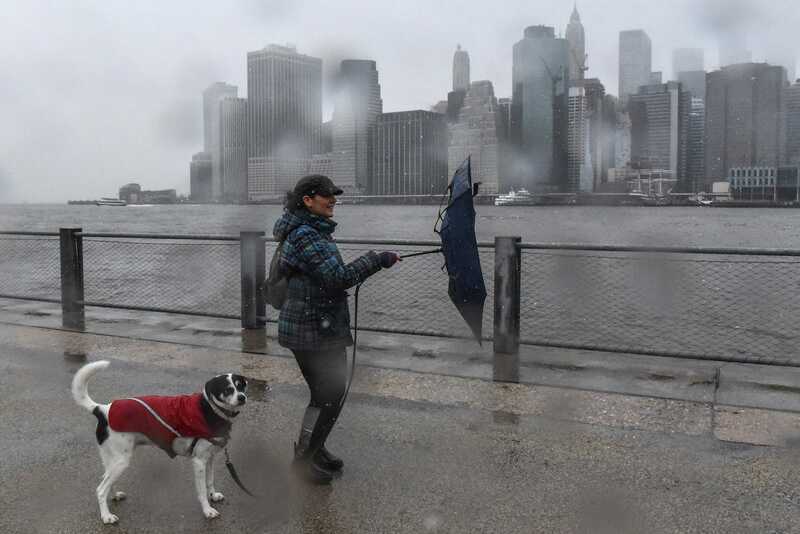 The National Weather Service says things will get worse Friday night into Saturday, with harsh winds gusting up to 50 mph well inland, downed tree limbs and power lines, and wet snow. In a video on Twitter, Eric Fisher, a meteorologist, showed how the Union Wharf waterfront condos were quickly becoming water-filled condos. Around 10 a.m. ET, the tide in Boston was already high enough for this kayaker to head out into the flooded streets. 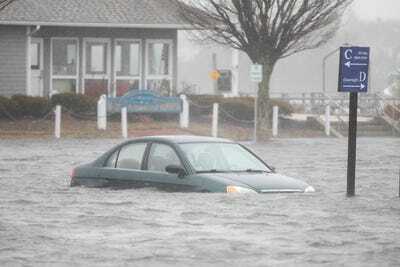 The National Weather Service recorded the tide at 14.67 feet about an hour later. 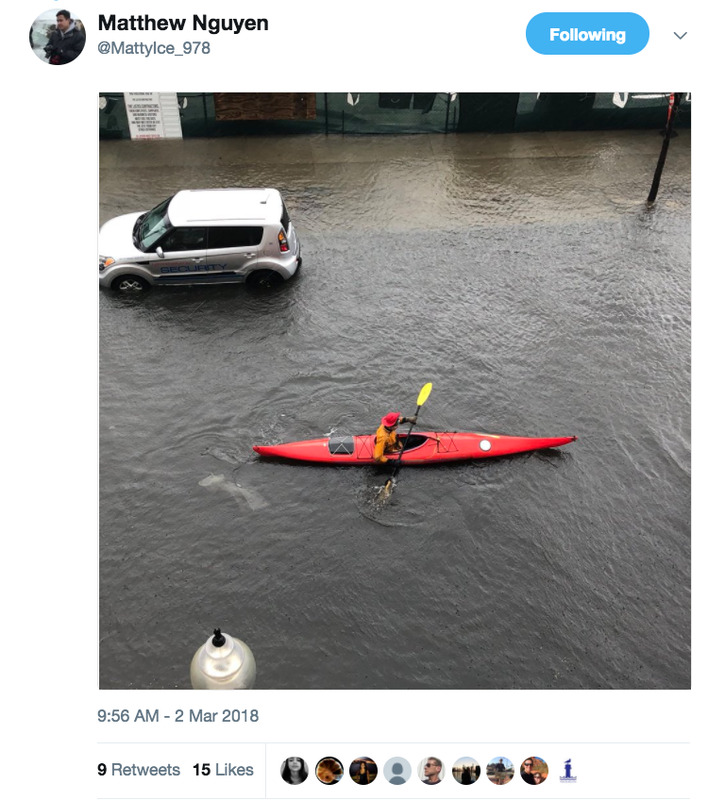 Twitter/@MattyIce_978A kayaker cruises the flooded streets of the East Boston waterfront. 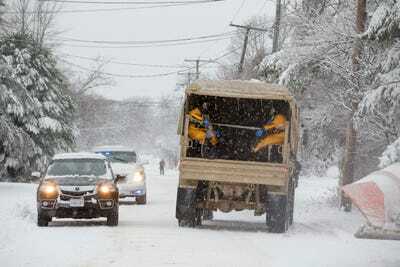 By 2 p.m., there were reports of nearly 1.6 million power outages along East Coast. 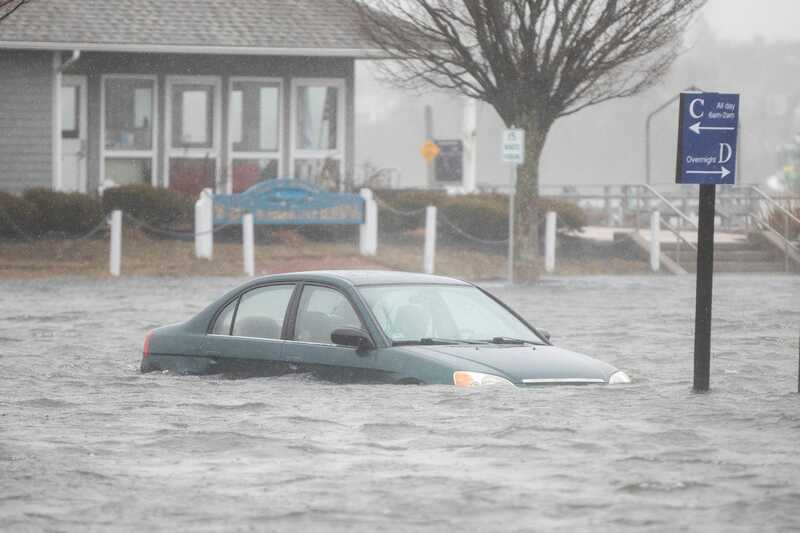 Scott Eisen/Getty ImagesA vehicle drives through floodwaters in Scituate, Massachusetts. Fairfax, Virginia, was hit especially hard, but the outages cropped up along the coast, with pockets of suburbs of DC, New York, and Boston falling off the grid, WTOP reported. The NWS said the nor’easter would stay powerful through the night, warning that conditions could worsen into the weekend. Scott Eisen/Getty ImagesWaves crash over a house in Scituate, Massachusetts. Damaging winds gusts of more than 75 mph could continue into Saturday night in some spots on the cape. Police officers were out in a neighbourhood of the seaside Boston suburb of Duxbury, where things weren’t looking good for this brown house. 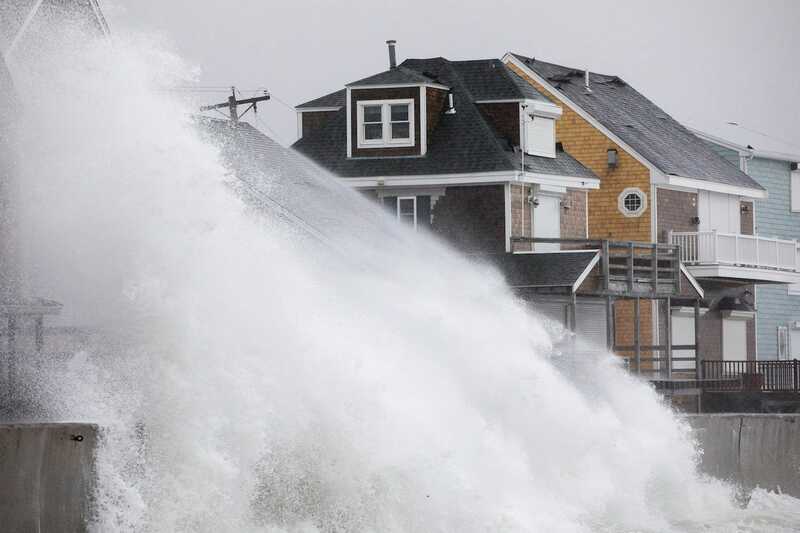 The NWS in Boston said the state’s entire coastline could see waves up to 35 feet high into Saturday morning. Scott Eisen/Getty ImagesSandbags and wood set in front of a home in Scituate, Massachusetts. On the East Boston waterfront, Matthew Nguyen recorded this footage of waves rolling into the streets. The coastal town of Scituate, Massachusetts — midway between Boston and Plymouth — was virtually underwater on Friday. 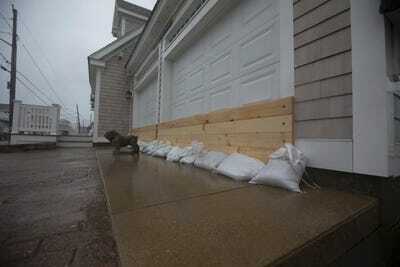 Waves in the town were recorded at 20 feet high, and the tide rose to 14.7 feet on Friday morning. Down the coast in New York, the weather got so bad that both LaGuardia and JFK airports issued ground stops. Stephanie Keith/Getty ImagesA woman struggles with her umbrella while walking her dog in Brooklyn. The winds in New York were especially bad, gusting up to 60 mph, according to the NWS. On Twitter, people started referring to the storm as #Windmageddon. Airlines canceled flights out of major airports in the area, including Newark. JFK and LaGuardia airports were both temporarily shut down. The wind in Washington, DC, was so bad that one pilot landing there said most passengers were throwing up. 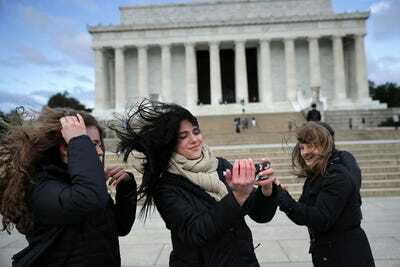 Chip Somodevilla/Getty ImagesTourists facing high winds while visiting the Lincoln Memorial in Washington, DC. The report said that “pretty much every one on the plane threw up.” The pilots said they almost did, too. The storm is just the latest in a rash of severe-weather events recorded around the world this year. Just days ago, Rome recorded its second snow in 33 years. 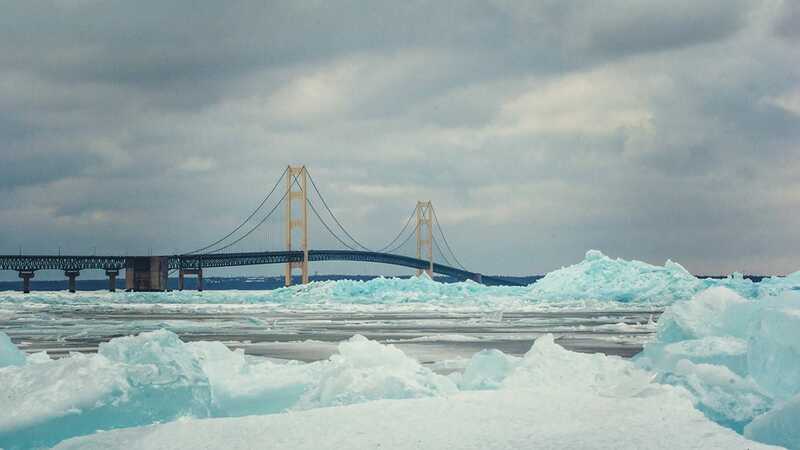 In Michigan, locals are marveling at the dense, blue, Arctic-style ice cropping up on the shores of the Great Lakes. It’s a rare sight. 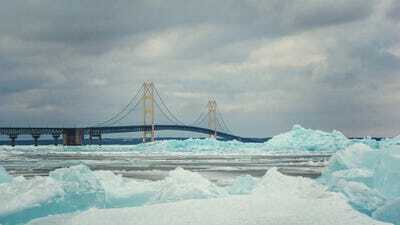 Experts who study the Great Lakes aren’t sure why there’s so much of the ice this year. Anne Clites, a scientist at the Great Lakes Environmental Research Laboratory of the National Oceanic and Atmospheric Administration, told Business Insider that records showed that there was a lot of thick ice in the straits this year that went away quickly as things got warmer and windier. Californians are also seeing snow this week, as a major winter storm rolls across the northern part of the state. Heavy snow and strong winds landed near the Sierra Nevada mountains. Officials told people to stay off the roads in some areas. Farther south, people are worried about another rash of dangerous mudslides in a region where 20 people were killed by slides in January. And Boston is still reeling from one of its worst storms that froze entire neighbourhoods just weeks ago. Scott Eisen/Getty ImagesA National Guard vehicle carries rescue divers in Scituate, Massachusetts. It’s another reminder that as the Earth’s climate is changing, more frequent and extreme weather events are on the way.